And it was so simple to do. First a little bit about Inventibles. It bills itself as a hardware store for designers and you can buy some very unique items here. If you aren't on their email list, you should consider it. The stuff they have is just down right inspirational. 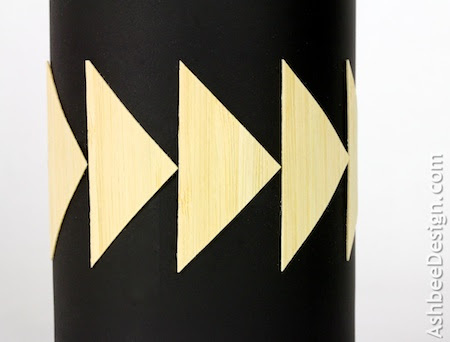 I purchased two pieces of bamboo veneer for my lamp but in going back to the site, they have a version that is adhesive backed. That would have been better for this project. A collection of empty bottles. I used wine bottles, a balsamic vinegar bottle, a fancy liquor bottle and an old candle jar. 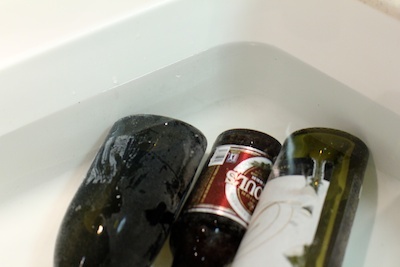 Soak the bottles in hot water and scrape off all labels. 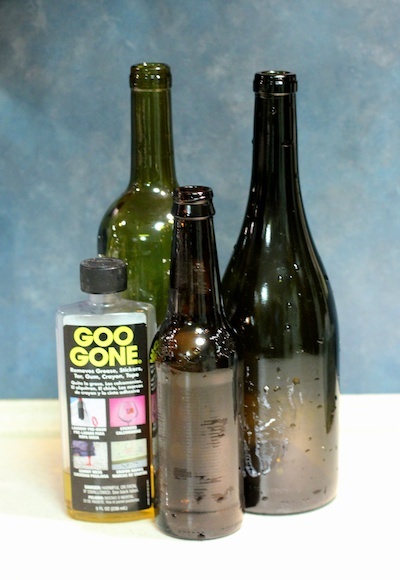 Clean off any residue glue using Goo Gone. Wash the bottles in hot soapy water and dry. 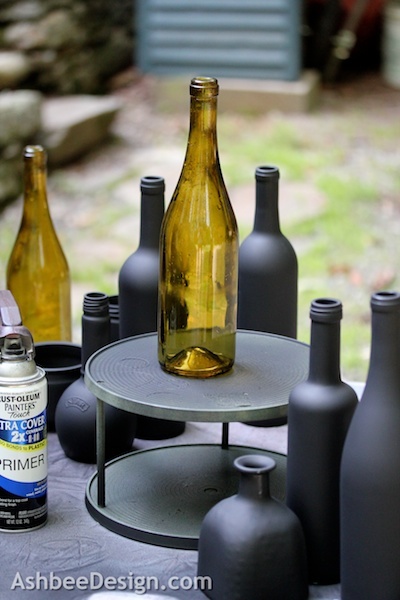 Spray the bottles using flat black spray paint. Follow all spraying instructions. Work outside on a windless day. Spray with many light coats to prevent drips. 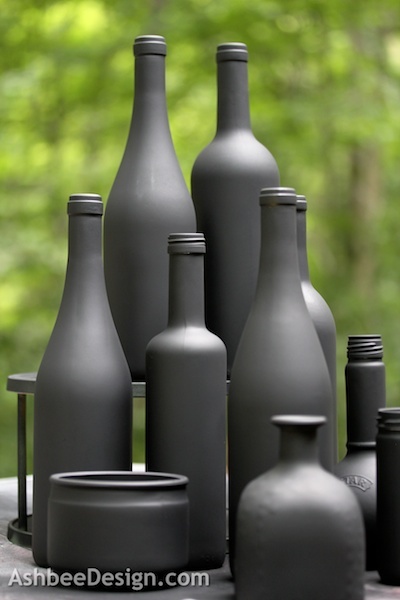 Stop and take some photographs because flat black bottles are an excellent subject. 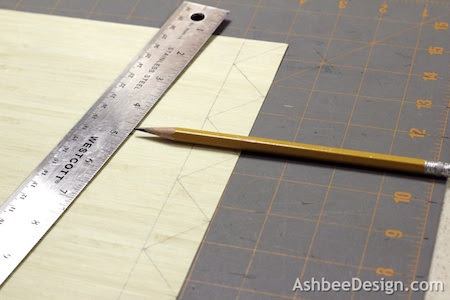 Draw cut lines on the back of the veneer. My triangles are isosceles triangles with a base that is 2" long and a height of 1". Use a ruler and sharp pencil because precision matters. Important Note: Pay attention to the grain of the wood. You will want it to run perpendicular to the curve of the bottle. That will impact how you lay the triangles out on the veneer. I did some sets as shown in the photo below. And I did some sets turned 90º. 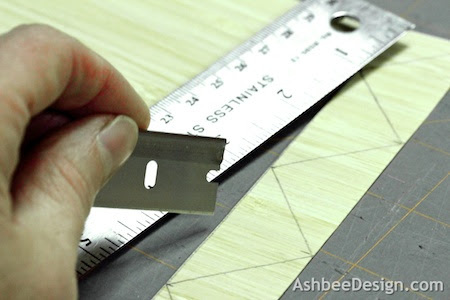 Using a sharp razor blade and a metal ruler cut the triangles. The material is thin and cuts easily. 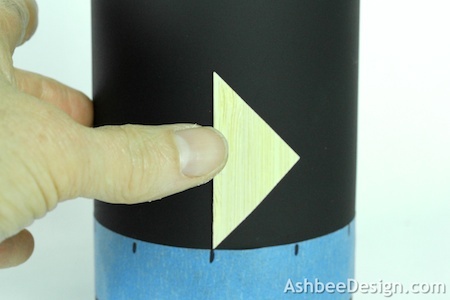 Use painter's tape to mark the position of your design. 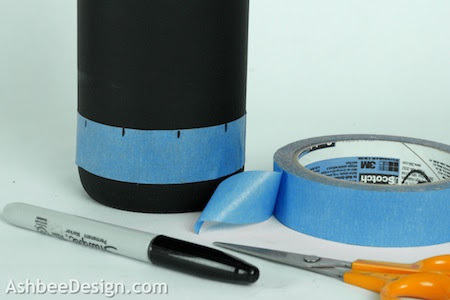 I made precise markings on the tape, then put the tape on the bottle to help in accurately positioning the triangles. 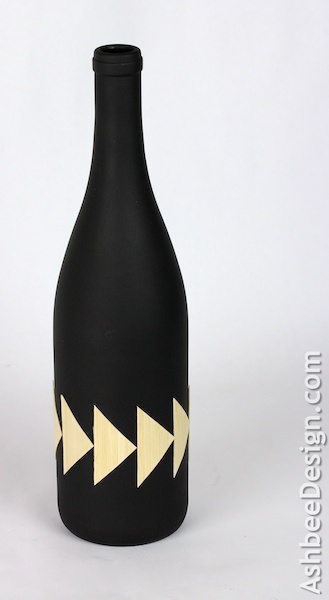 I measured the circumference of the bottle and used painter's tape to evenly space the designs that wrapped around the bottle. I wanted the pattern to end evenly so it required advance planning. 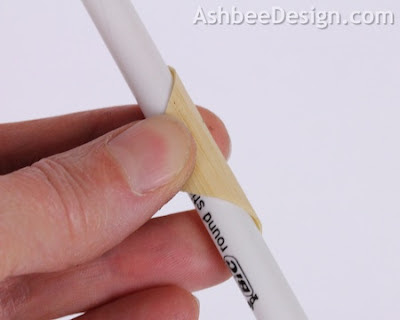 Curl the veneer piece around a curve object ( I used a bic pen) to give them a slight curve. This helps them stay in place. The bend goes with the wood grain. I didn't have adhesive backed veneer so I used spray glue (3-M Super 77) and sprayed the back of each triangle and then carefully positioned it on the bottle aligning it to the markings on the painter's tape. Update: After a week the spray adhesive started to let go. I added 5 minute epoxy under the corners and that held much better over time. 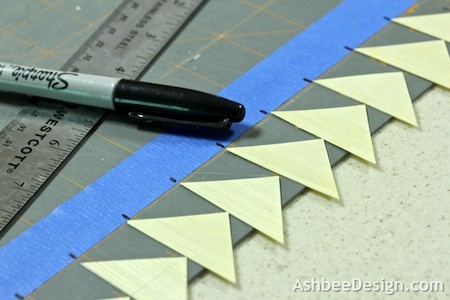 Apply all the triangles for your pattern and then remove the painter's tape. 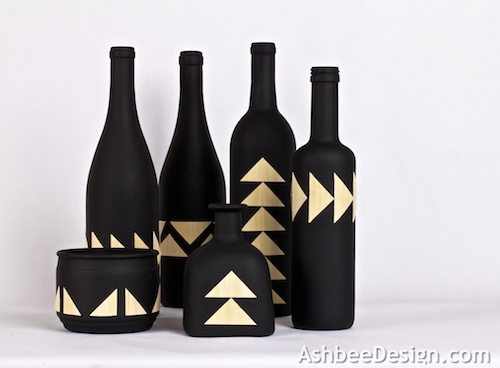 Create different patterns on different shaped bottles. 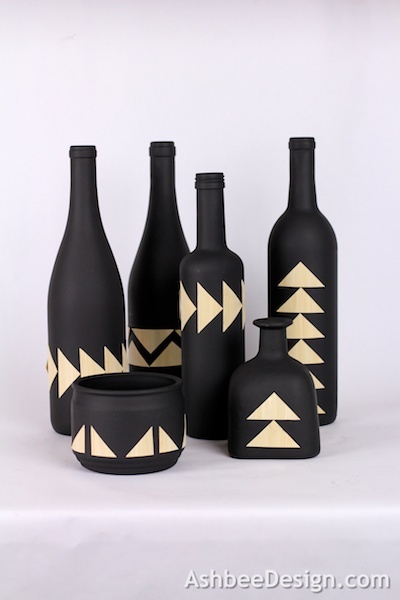 All of the patterns on these bottles were made using the same sized triangle just arranged differently. Those are just so striking and cool! Love this project! Thank you Linda. I really like the graphic nature of the design. These look great! So clever! Absolutely stunning! I just wanted to let you know that I featured your wonderful project on homework. Thanks so much for sharing it on The Inspiration Board. Have a great weekend! These are really beautiful. They have an ethnic look to them. Thank you for sharing it at What We Accomplished Wednesdays. Have a great weekend! Cool idea. I really liked your detailed pics and instructions. Very easy to follow. And easy to do. 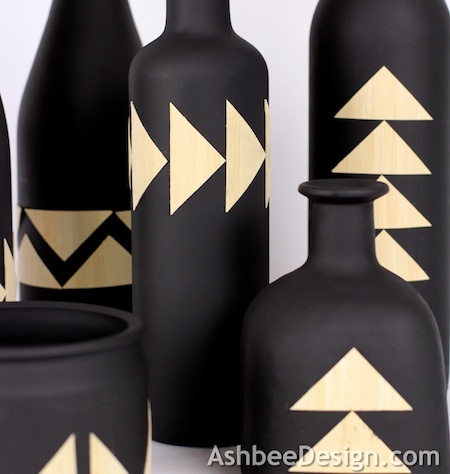 I love craft projects that are quick, easy and have high impact results. This one qualifies.